Let the power of the DVDâ€™s dynamic imagery guide you through an intimate one-on-one free motion machine quilting lesson with Patsy Thompson. Relax and learn free motion machine quilting from the comfort of your own home, at your own pace, and by the terms of your busy schedule! 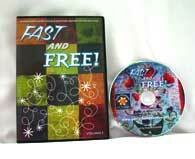 All DVD discs are Region-free and will play in all DVD players worldwide! If youâ€™ve ever admired machine quilted feathers and wished you could stitch them yourself, then this instructional DVD is for you! Beginning with a tutorial on marking the quilt sandwich, this DVD guides you through stitching freeform feathers, feathered hearts, whimsical feathers, and feather embellishments with decorative threads. The tutorial then turns to feathers with a stitched spine and curley-cue feathers with a stitched spine, and then a discussion on ThreadPowerâ€¦the use of thread as an additional design element in your quilts. It rounds out with a final discussion on uses for feathers in traditional quilts, contemporary quilts, and in art quilts. With such a versatile design element, what quilter wouldnâ€™t want to learn the art of machine quilted feathers?! Purchase this disc today for only $29.95 USD plus shipping & handling! Note: The free Adobe Flash Player browser plugin, version 8 or higher, is required to view video. 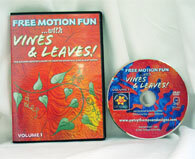 If youâ€™ve been intrigued by the graceful curves of vines or the intricate designs of leaves and wish to stitch them yourself, then this DVD is for you! 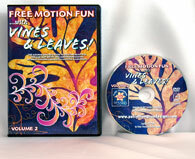 With designs applicable to traditional quilts, contemporary quilts, and art quilts, this DVD is a step-by-step tutorial on the free motion stitching of a wide variety of vines as well as garlands of flowers and leaves. 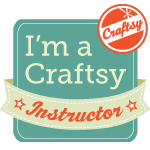 You will then learn how to add more interest to your vines and leaves through hyperquilting, or overquilting your stitched motifs with a high contrast decorative thread. Bring the garden of your fantasies to life with your sewing machine as you master these free motion designs and techniques! If you are captivated by the delicate veins of leaves or the curvaceous line of a meandering vine and are looking for ways to add texture and interest to your quilts, then this DVD is for you! This second volume of vine and leaf motifs takes off where Volume 1 ended! Weâ€™ll begin by learning new vine and leaf motifs to add to your design repertoire, but thatâ€™s only the beginning! Weâ€™ll blast off into the exciting world of free motion machine embroidery, and youâ€™ll see just how easy it is to use your free motion skills to add another layer of interest and texture to your quilts! Using your new skills of hyperquilting, free motion embroidery, and free motion machine quilting, your quilted botanical motifs will add new dimension and intrigue to your quilts! 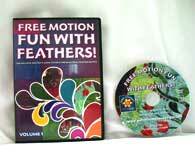 Are you new to free motion machine quilting and need guidance from the ground up? Are you a seasoned free motion machine quilter and looking for some new design ideas for stitching quilted motifs? Then either way, this instructional DVD is for you! 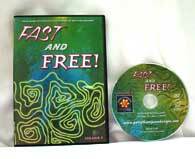 This DVD begins with a discussion on the basics of free motion quilting, and then turns to a lesson on preparing the quilt sandwich. The mysteries of mastering sewing machine tension are then unraveled before basic lessons in free motion machine quilting begin. Once the basics are covered, the viewer is introduced to the concept of â€œFast and Freeâ€…the technique of creating countless spin-off designs, just by making a small change in one base design. Watch and listen as Patsy shows and discusses how to stitch 18 different quilting designs and gives ideas for additional related spin-off designs. The tutorial ends with a detailed lesson in how to convert your closed toe free motion foot to an open toe foot. With designs suitable for traditional quilts, contemporary quilts, and art quilts, what machine quilter wouldnâ€™t benefit from a tutorial like this?! Purchase this disc today for only $29.95USD plus shipping & handling! Are you bored with stippling and searching for new design ideas?If you’re intrigued by the wonderful variety of textures created by intricate quilting designs, or if you just LOVE quilting and are on the lookout for novel background fill designs, then this instructional DVD is for you! With designs applicable to traditional quilts, contemporary quilts, and art quilts, Patsy explains and then demonstrates how to stitch 29 different designs and gives you the tools to create even more spin-off designs!The tutorial ends with a detailed instruction on how to build your own Plexiglas extension table for your short-arm, mid-arm, or long-arm machine…think of the money you’ll save over buying a frame system! With designs suitable for traditional quilts, contemporary quilts, and art quilts, what machine quilter wouldn’t benefit from a tutorial like this?! To be notified by email when new DVDs become available, please sign up to our New Releases Mailing List!